Who was Mary Harriman’s most famous friend? It’s a good bet she was Anna Eleanor Roosevelt. While credit for the founding of The Junior League rightly belongs to Mary Harriman, she was supported in its early days by a remarkable group of young New York women—all from prominent local families—who shared her commitment to voluntarism and civic leadership. One of those women was Eleanor Roosevelt. 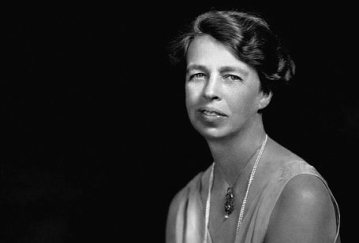 Long before she came to the nation’s attention as a First Lady, Eleanor Roosevelt joined the Junior League of the City of New York and began to find her voice as a leader. For her, the League was the start of an illustrious career that extended well beyond her White House years. Along with other Junior League volunteers, Eleanor worked with immigrant children in the settlement houses of New York’s Lower East Side, then an environment of intense poverty. Years later, her husband Franklin Delano Roosevelt would credit her and The Junior League with showing him a side of New York he had never seen before. Of course, the rest really is history. Eleanor was three times a First Lady, the first U.S. delegate to the newly established United Nations, and a forceful advocate for the rights of workers, women, and children. In 1961, during President John F. Kennedy’s tenure, she chaired the Presidential Commission on the Status of Women.